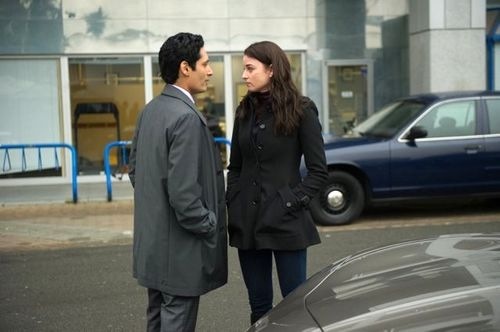 Home / Continuum / Reviews / Time Travel / TV / [Review] - Continuum, Season 3 Episode 2, "Minute Man"
[Review] - Continuum, Season 3 Episode 2, "Minute Man"
"Some things are obvious when you pay attention... and time travel is involved." Really, Kellog? Because I've generally found the opposite to be true. Obvious is not the word I'd use. But yes, paying attention is very important. Critical, I'd say. Necessary, in point of fact. Take this episode, for instance. Compared to last week, this was fairly tempered. No massive info dumps, not as much exposition, and less timey-wimeiness. But it was still a densely packed episode, one that required the viewer to keep the events of the final two episodes of last season in the back of the mind, to compare and contrast the effects that Alec has had on the timeline. Because he has, and it's not all been sunshine and roses. I'd go so far to say that, despite the death and emotional turmoil that the old timeline was soaked in, this timeline has all the markings of being a darker sequence of events. Hit the jump for the review, which contains spoilers that intend to exact painful and bloody revenge. A few words before we begin, on the new opening credits sequence: I didn't care for it. Maybe it'll grow on me, but at first glance it seemed too... generic. Floating heads and series iconography seemed less effective than the course and simple title shot. The hard drop of the title at the end of the cold open every week was a kind of punctuation, which was good because it usually followed a flash into the future which carried some dire warning of the slippage of society (as this episode did). A long, floaty, CGI sequence is too nullifying. It doesn't shunt the viewer into the episode, it lulls them. I don't know the behind the scenes reasoning for adding the sequence. I don't know if it was Barry (the creator); if it was Showcase (the originating network); or, and I doubt this, if it was Syfy (the lamprey in this scenario). Whomever the cause of it's presence, I feel it a rare misstep in the evolution of the series. But it's a minor squabble, and easily overlooked by a well time bathroom break. This week was about getting us comfortable in the new timeline. We're still repeating a bit of last year, and haven't caught up to the finale just yet. Right now, we're occupying Second Last, if I'm remembering correctly. In this episode, we moved past Emily's original time of death. Her survival and Escher's death last week signify the hardest breaks in the timeline. From here on out, we're into brand new territory. For instance, with Escher's death, Piron's influence has been completely diminished, the most immediate result being that the VPD does not undergo a radical transformation into a privatized militaristic force under the command of Dillon. So, as I assumed last week, Carlos is not forced into a crisis of conscious, nor does he turn to Julian in his time of need. This also means that Betty's involvement with Liber8 remains secret, though she appears to have attracted both Alecs to her trail with her miraculous discovery of the Liber8 "confessional." That's not to say that Carlos is undergoing a crisis. Since he discovered Kiera's secret last season, Carlos has fulfilled the role of audience surrogate on the show, taking over from the no longer wide eyed and innocent Alec. He gets to crack jokes, and point out when things get confusing and make no sense. He, like the rest of us, gets to watch Kiera do her thing, then squint real hard and try to figure out how the pieces all fit together. With this episode, bringing him the corpse of herself, Kiera appears to have broken Carlos' brain. The morality and the philosophy and the general all-of-it-ness of time travel has driven Carlos into a dark place, and I don't think he's going to be as easy going in the future. Perhaps this darkness will lead him to Julian after all, we'll have to wait and see. The one aspect of the time travel the series hasn't really touched on is the "elastic theory," the idea that events tend to reorganize into as close as the original configuration as possible. There was some talk along those lines last year, but it was shelved in favour of all that nice stuff about Julian and determinism, and the larger picture stuff. Liber8 resurfaced here, Sonya and Travis having put their differences behind them and finally reconfigured their methods from defensive to offensive. The first place they take the fight is to Jim Martin, Carlos' former friend and general scuzball. The Mayor Elect benefited from Liber8 being largely destroyed in the original timeline, but here he's forced to face the writing on the wall and admit to the police his allegiances. Liber8 proceeds to strip him of every bit of influence and power he has, forcing him to throw himself as gracefully as he could onto his sword. I feel like this might have a greater bearing on how Betty's secret will play out in this timeline. In the original, Carlos was accepting of her revelation because he himself had been forced into a desperate moment. In this timeline, all Carlos sees is betrayal and death surrounding him. When she is revealed, it would be with tepid acceptance, but with harsh and simmered anger. With two Alecs suspicious of her, I can't imagine she'll remain shrouded for much longer. A lot happened with Alec too. Later Alec is still very goal oriented, to the increasing detriment of his relationship with Kiera. Funny, how he spent so much of last season alienating himself from her, and now she's one of only two people in the world that can know he rely on. By episode's end, he seemed to have realized the catch-22 of his situation. He can save Emily, but he can't be with her. She can be with Now Alec, and they can go on to have full and happen lives, and bring about the future that Kiera wants. but Later Alec is forced to shrink back, observe a world he can never be part of or have any influence over. Because of the nature of this show's time travel, he doesn't get erased, or folded back into Now Alec, or have his memories rewritten. He gets to loiter, stung and depressed by the memories of seeing Emily die, and have that conflict with the knowledge that she's still alive and he can never touch her. Kiera is meant to be deciding which of the two Alecs will bring about her world, which means that eventually one will be eliminated. So far, things have only went bad for those native to the timeline, while the travellers are only adding to the misery. My favourite line of the night was when Kiera turned to Alec, at the news of Escher's death, and asked "what did you do?" Such a wonderful thesis question for this season, and delivered wonderfully by Nichols. Some final thoughts. Kellog, for all his smarminess, if probably my favourite character. His scenes this episode were wonderful. He's a duck: everything rolls off his back, and he adapts accordingly. His feet are kicked out from under him when he finds out that Escher is Alec's father, and immediately rebounds by using that information against Emily. I'm going to draw a light connection between Kellog and Littlefinger over on Game of Thrones. Both manipulate people with the information they've gathered, and will probably both be left standing when the dust clears. Elsewhere, can we all agree that Kiera is terrible at clearing a scene? Yes, I suppose the emotional awkwardness of covering up your own murder might make you less than detail orientated, so missing a few blood drops can be ignored. But an entire pouch filled with a time travel device: that's just bad police work. I was also a little put off by how chummy Now Alec was with Kiera. I might have to go back a rewatch season 2, but wasn't Alec still hostile towards Kiera at this point? I get that it's easier to have one trustworthy Alec and one suspicious one, but the Alec of then was mistrusting of Kiera pretty heavily at that point. One last thing: last year I mentioned how I thought that Kiera's future wasn't that bad. As dystopias go, it ranks among the nicer ones. That was until the Fahrenheit 451-style "old media" purges, and approved materials police were introduced here. Suddenly, this future isn't looking so bright and shiny to me. I was fine with everything, until the debt collector said "approved materials." Suddenly, I'm out. Choose the sulky bitter Alec, Kiera. Your family isn't worth the loss of books.